Use this document to give someone else the legal authority to sell your house, flat or land on your behalf. This document grants temporary powers to act for you in matters relating to the sale of one or more of your properties. For example, you may wish your solicitor or your estate agent to be able to sell your home in the UK now that you have emigrated abroad. The person acting for you - your attorney - can be given only specific tasks relating to the sale of the property, or can be given the power to do everything to close the sale. You can of course, also specify matters which you do not want the attorney to have control over. You can give the authority with immediate effect, or you can specify the start date. 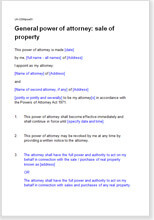 You shouldn't confuse this document with a lasting power of attorney for financial affairs, which is used to manage your property when you lose mental capacity. We do offer a free service for LPAs, but this document is only suitable while you have mental capacity. We discuss the types of PoA in this article. We also offer another version of this PoA that can be used to give authority to carry out other actions.